The first instalment of this feature has been a long time coming. I’m no fashion connoisseur, but I appreciate the art and am beginning to learn it, so this feature is a great tool. Also, fashion vocabulary is not something I’m familiar with, so bear with me! 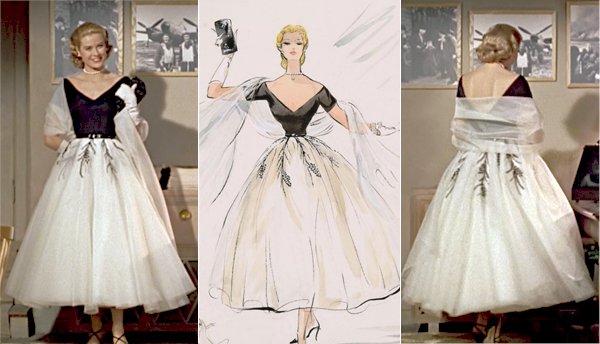 Naturally, it could not begin without the work of Edith Head, a prominent name in costume design. She worked with some of the most famous actresses of Old Hollywood, many times at their special requests, like Ginger Rogers, Mae West, Elizabeth Taylor, Bette Davis, Audrey Hepburn, Natalie Wood, Gloria Swanson, Sophia Loren, Marlene Dietrich, Rita Hayworth, Katharine Hepburn… the list is endless, and breathtaking. So don’t be surprised if future posts include the works of this unbelievably talented lady. All great deal of the costumes she created were the product of her constant work with no other than the master of suspense, Alfred Hitchcock. For him (and at times with him), she dressed Ingrid Bergman in Notorious, Kim Novak in Vertigo, and Grace Kelly in To Catch a Thief and Rear Window, just to name a few. For the film in question, Head designed two dresses, one two-piece, one suit, and one negligee. From the five outfits, the black and white two-piece above is by far the most iconic, being copied many times afterwards. Though the green tailored suit is not a favorite for most, I do love the shoulders and round lapel. It’s said the color was picked by Hitchock himself – not a surprise, considering how obsessively careful his portrayal of women always was. In fact, between moments of exciting anxiety, Grace Kelly is all we can see – the camera is in awe with her elegance and grace, and so are we. 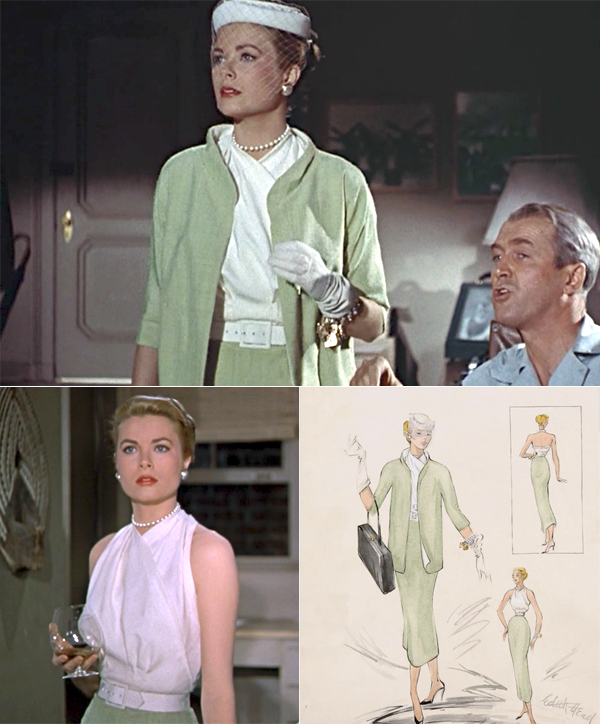 Wearing the mentioned green suit, she walks slowly around the room, from one of Jeff’s sides (James Stewart) to the other, effortlessly striping down her gloves, head piece and jacket, teasing us all the way. Until she’s left with an exquisite and sensual bare-back white top – but you won’t find it that easy to see her back. The reason we can go on and on about such details is because they seem deliberate, like Hitchcock himself is teasing us. So I wouldn’t be surprised if he did pick the color. 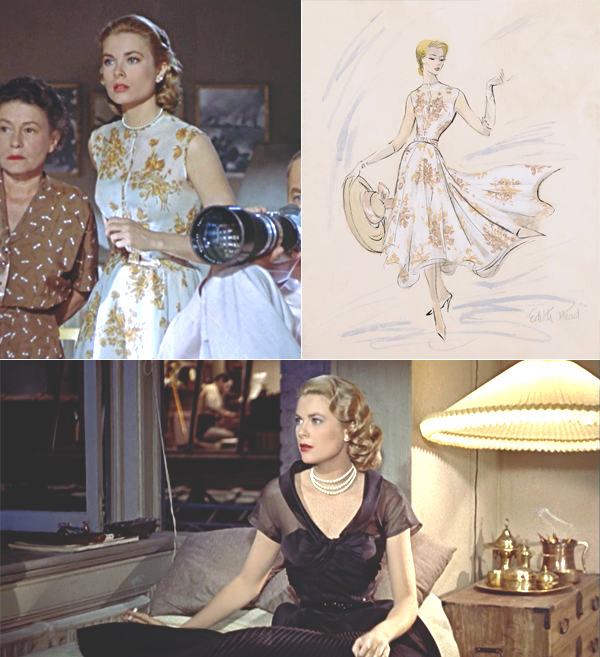 Later on the film, we catch a glimpse at a flattering pleated dress of black silk, and a more casual sleeveless dress with a floral pattern. And of course, the sensual and light negligee, which humorously contrasts with Jeff’s common pyjamas. By the way, don’t mind Stewart’s ridiculous face above, I wasn’t really paying attention to him – and chances are, you weren’t either.